Cast: Johnny Depp, Keira Knightley, Orlando Bloom, Bill Nighy, Jack Davenport, Mackenzie Crook, Geoffrey Rush, Kevin McNally, Naomie Harris, Lee Arenberg, Stellan Skarsgard, Tom Hollander, Jonathan Pryce, Chow Yun-Fat, Keith Richards. Story: Random piratey gallivanting, part 3. Running Time: 2hrs 48 minutes. Yo ho ho and a deja vu - Pirates 3's another Pirates 2. It's nearly summer again and the Pirates wheel rumbles on. Whether this instalment is to your liking will depend heavily on your opinion of its predecessors. Many viewers who enjoyed the first Pirates of the Caribbean found episode 2 a swagger too far. This makes my life easier because chunk 3 is more of the same, so if you disliked the second, you'll feel exactly the same about this one. Johnny Depp again effortlessly steals the show as the charismatically camp Jack Sparrow, as he has done in every episode of this overtly unamerican series. I say unamerican because apart from Depp himself, who's practically an honorary brit as it is, there are virtually no septics in the cast at all - unusual for a Disney film. Keira Knightley, Orlando "hambo" Bloom, Geoffrey Rush, Jack Davenport, Chow Yun-Fat, Bill Nighy, Mackenzie Crook, Kevin McNally - nary a yankee between them. For landlubbers this side of the pond, that gives things a homely feel, but with a huge budget to boot - something of a new experience for us limeys. The colossal bag of booty spent on the movie has the happy consequence of some quite stunning special effects. It seems like the Oscars have only just passed, but this is already an early contender for 2007 Visual Effects. The key to good effects is blending them with the live action - and for once they've achieved it even in the headlining set pieces. Not since War of the Worlds has this been done so successfully. The effects hang off a typically convoluted and daft plot, which could use a tad more clarification at times - but then it would be harder to turn the brain off, and that's a must! When you start with the knowledge that the lead character is going to be brought back from the dead before things can get going, you're prepared for some liberty-taking in the plot department. Even so, our credulity is stretched rather a long way at times. Never mind, it's all in good fun. Good fun is what it's all about. From the first scenes containing some rather adult jokes - subtly done so the kids won't notice - we're tickled throughout. Whether it's the monkey monkeying around or the painfully obvious screenplay gags, a smile is never far away. Even the surreal scene containing multiple Jack Sparrows was amusing - though this is a Marmite scene that many viewers will dislike. Fans of the series will be pleased to notice the wide-open ending - though the near-three-hour running time will leave your bum cheeks hoping that Pirates 4 is some way off. 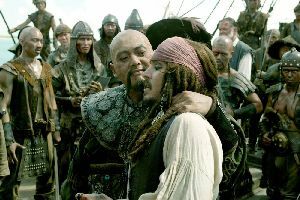 Fortunately there's always something happening and it always looks fantastic - and top marks to director Gore Verbinski for giving his pirates crappy teeth - now there's a detail that confirms the unamericanness of it all! 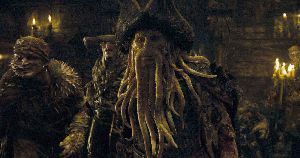 Pirates of the Caribbean: At World's End is exactly as you would expect. Great fun, not to be taken seriously, it's perfect brain-off entertainment held together by Johnny Depp's central creation and sublime special effects. The only reason it doesn't get a maximum five is because it's just too similar to the previous one. Arrr. Testosterone Satisfaction Rating: 2/5 - lots of family-friendly swashbuckling. To enjoy this film you should: watch the second one first. Pirates of the Caribbean: At World's End was released in the UK on 24th May 2007.